Microneedling is a safe, effective way to improve the skin’s tone and texture, reduce pigmentation and improve scars and stretch marks. Noticeable results include a reduction in the appearance of fine lines and wrinkles and younger-looking skin with fewer signs of aging. 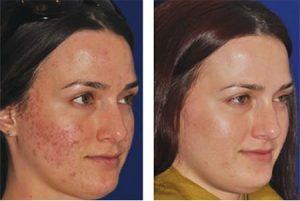 Microneedling also has a positive effect on hyper-pigmentation as well as on hypo-pigmentation, acne scars, traumatic scars and stretch marks and generally creates a fresher appearance or glow to the skin. Microneedling treatments can be performed on all parts of the body including face, neck, décolleté, arms, hands, legs, abdomen and back. The procedure is performed by a licensed esthetician and takes 30 minutes to an hour or more, depending on the area. treatment usesuses tiny sterile needles to safely and precisely create controlled micro-injuries to the skin, triggering new collagen production. Watch an actual microneedling treatment! What is this treatment and what is it used for? Microneedling uses tiny sterile needles to safely and precisely create controlled micro-“injuries” in the skin which then trigger new collagen synthesis. It is used to improve the tone and texture of the skin, reduce pigmentation and improve scars and stretch marks. How many treatments are needed and when do you start to see benefits? Typically a series of 3–5 treatments is performed for optimal results; however, each treatment will induce some collagen remodeling and microneedling can be performed for ongoing maintenance. Deepermicroneedling treatments can be slightly uncomfortable so a topical anesthetic will typically be applied ahead of time to reduce any discomfort. More superficial treatments are well-tolerated without any anesthetic. Immediately after a treatment the skin can appear flushed like a light sunburn to deeper pink with pinpoint bleeding for deeper treatments. Typically any redness will resolve within 1–2 days. Make-up can be applied immediately. Mild discomfort and redness are common effects. Very rarely, treatments could lead to a cold sore reactivation or other infection, formation of granulomas (small bumps under the skin), permanent color change or scarring. You should not have a microneedling treatment if you have vitiligo, have an active skin infection (such as flat warts or a cold sore), or have taken isotretinoin within the past 6 months. Please notify your provider if you are prone to excessive/keloid scarring or have a collagen vascular disease such as lupus.